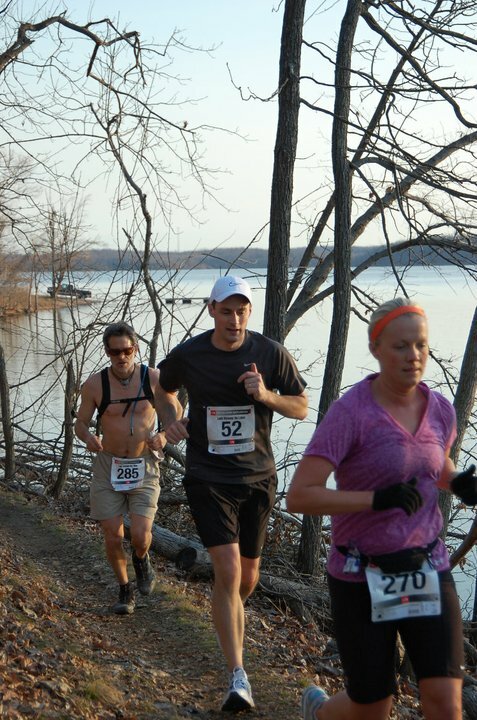 When I registered for The Land Between the Lakes Marathon several months ago, I really didn't realize it was a trail run. I guess I knew, but didn't think anything of it. Going into race day I was a bit nervous. I had heard this course was technical... um, at the time I wasn't sure what that meant, now I know it means lots of roots, rocks and other obstacles on the trail. I heard the hills were killer, and it had rained a lot the week before the race, so I was anticipating the trail to be muddy. 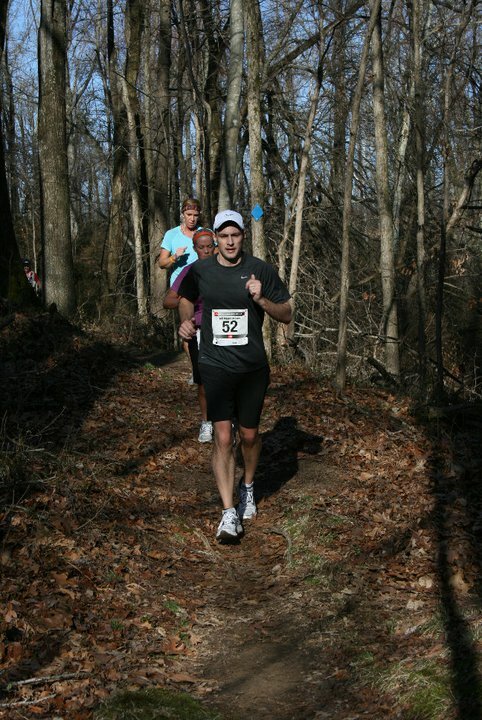 (it was, but only in a few spots) I hadn't trained on trails at all, and I didn't have trail running shoes. Once we hit the trail, it was single file line, which makes it difficult to pass a slower runner in front of you. We learned pretty quick to keep your eye on the ground in front of you. The leaves from the fall were still covering most of the course, so it made for many irritating twists of the ankles, because we couldn't see what we were stepping on. I was kicking myself for not buying trail shoes. There were a few muddy spots, but for the most part, pretty dry. The scenery was gorgeous... just wish I could have taken my eyes off the ground to enjoy it more. The lakes we ran around were beautiful and smooth as glass. My favorite little section was when we finally came down off the MANY hills and ran through a swampy section with frogs singing to each other. Who needs an ipod when you can listen to the frogs croak. Loved it. Hubs finished his loop and ran his 1.7 miles to the finish line on pavement. 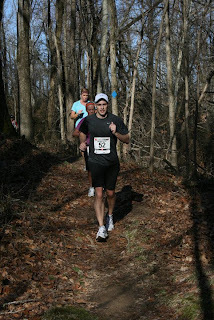 He finished in 2:32, which is great considering it was his first race EVER, and the trail slows you down quit a bit. I ran on the trail for one more loop, and ate the dirt not once, but twice. The first fall (my left toe grabbed the tip of a tree root) was at about 16 miles, and I ate it hard. Both knees, hands and my right shoulder hit. Once I made it to the next aid station, I was able to clean up a bit and get back on the trail. I was very hesitant after my first fall and slowed my pace, which was OK, because the hills were coming up. I walked up each hill, they were mostly short but STEEP, and went on for about a mile and a half. 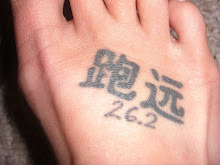 My second fall was about mile 22 or 23 not real sure, but no blood was shed. Look at this gorgeous view, to bad I didn't get to enjoy it much. This is my hubby taking the lead for a bit. 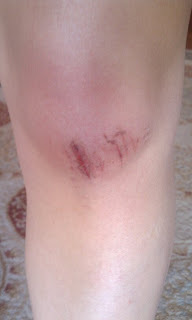 The left knee... it was pretty tender for the first couple of days. Feeling much better today and the right knee is just all kind of blue and purple. I finished my first trail marathon in 4:46. 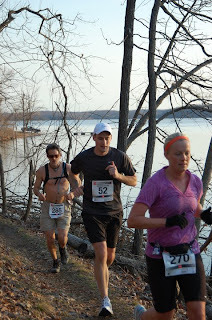 I didn't have a time goal, because I didn't know what to expect on the trail. I am hooked. I loved the trail. The time goes by so much faster, even though you are moving so much slower. This is a very well organized race, and has a gorgeous course. The volunteers were all super friendly. We will definitely be back to run this one again next year. Next trail run is in 10 days. Buffalo 50 miler in Utah. I plan on taking it easy for the next 10 days and letting my body recover as much as possible. Congrats you two! Stellar performance on the trails! Holy crap! A 50 miler in 10 days and then another marathon in 4 1/2 weeks? You are an insane runner! I love it! What an awesome experience! I can't belive you didn't have trail shoes. Trails are no joke! Major props. and might I add, that your time is right about my ROAD marathon time! Well done girl! ...and that picture of you and your hubby is awesome! Good job lady. Looking forward to finishing your 50 with you in 10 days. It will be great. Hope I'm fine running 17 on trail with regular shoes. See you soon. nice job!! rest up for the 50! That sounds like such a cool race! You did great! Think I should put it on my list for next year? I can't believe your racing schedule! I don't know how in the world you'll recover so quickly! Your time on the trails was great. 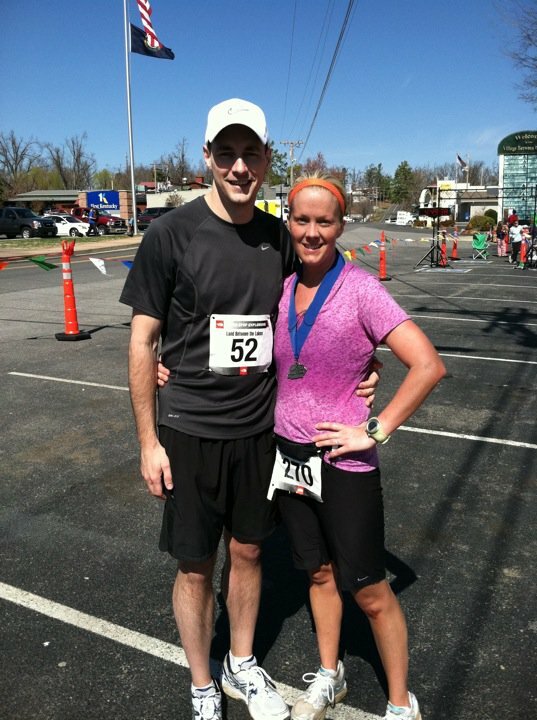 Hard to believe it was your first trail marathon. Ouch.. looks like you took a tumble. Check out this place for inspiration. 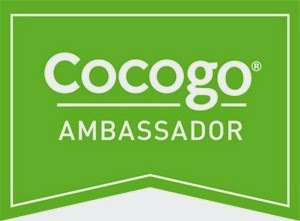 If you add us to your sidebar then we will send you a logo tech-shirt.